A man was stabbed repeatedly in his arm at a house in Cottingley in an attack which police believe is linked to an earlier dog fight. The 35-year-old victim was confronted by a man and a woman who called at his home in Cottingley Drive at around 5pm on Friday. The male visitor produced a knife and stabbed the 35-year-old leaving him with serious cuts to his right arm. Armed police were called to the scene but were unable to track the couple down. The stabbing victim was taken to hospital and later released after treatment. A 24-year-old man who was arrested on Saturday night on suspicion of attempted murder is currently receiving treatment in hospital under police guard. 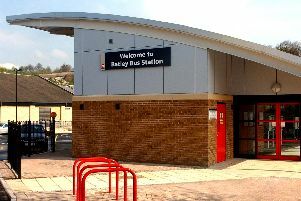 However, 25-year-old Amy Gidman, of Dulverton Place, Cottingley, was due to appear before Leeds Magistrates’ today (Monday) charged with possession of an offensive weapon, possession of a bladed article, false imprisonment of a woman and common assault in connection with the incident. A 45-year-old man and a 28-year-old woman who were also arrested as part of the investigation have been released on police bail pending further enquiries. Detective Inspector Phil Jackson, of Leeds District CID, said: “We are still very keen to hear from anyone who witnessed any part of this incident or who has any information that could assist the investigation. “We are aware there was an incident at the shopping precinct on the Cottingley estate at about 3pm which we believe is linked to the later attack. There appears to have been an altercation after two staffy type dogs attacked each and we would like to hear from anyone who witnessed that. Anyone with information is asked to contact Detective Constable Carmel Houghton at Leeds District CID on 101 or call the independent crime-fighting charity Crimestoppers anonymously on 0800 555 111.